Our dogs always have multiple nicknames, it just seems to evolve that way. 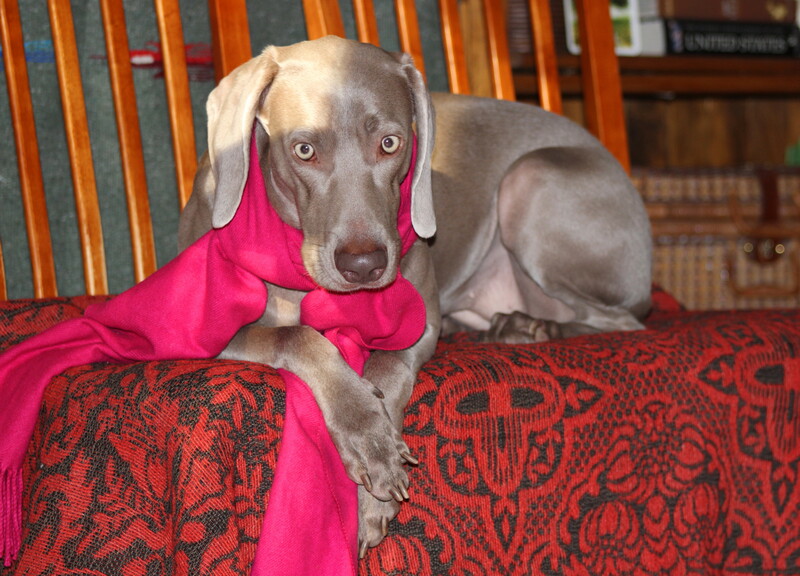 Last year we adopted “Zoey,” an enchanting, quick-witted Weimaraner. “Zoey” seemed too simplistic a name for her so it morphed slightly to “Zoey Zoe.” We added “Mojave” after learning that she had been rescued on the edge of the Mojave desert. “Zoey Zoe Mojave” suits our Weimaraner (my husband calls her that)–but I’ve settled on “”Zso Zso Belle” because she excels at being a diva and her beauty–inner and outer–is mesmerizing. Of late when I sit at my table working, Zso Zso (for short) climbs up on my chair and perches between my back and the chair’s. After observing this a few times, I considered whether I could train her to sit for a portrait. I’ve been reticent to try because of the stereotypes, due to Wegman’s work, of Weimaraners and portraits. But Zso Zso loves a challenge and engages eagerly in training of all sorts. So yesterday we held a little photo session and behold, she is secretly yearning to be a model. She yielded several poses before reluctantly surrendering her spotlight. This morning, as I worked quietly at my table, Zso Zso climbed onto the chair next to mine. She’s happy that you know who she is! LOL. I am constantly discovering her! She is a gorgeous model!!! What a darling story. If only my Max would pose for pictures, he gets irritated when I point the camera at him. She is just so beautiful. I love her color. I think that Weimaraner’s are almost other-wordly looking with their color of coat and eye.. so beautiful! thanks for sharing. Indeed there is something ethereal about them, not only in appearance but in their love and devotion. I’m delighted that you enjoyed this, thank you for your very nice note. She is a beauty! It’s so amazing to find a dog like that in need of rescue! Even the rescue volunteers who have helped hundreds of Weimaraners are enchanted by her beauty. We are all truly blessed, she is such a joy. Your images are wonderful, thank you for visiting my blog. We share a love of nature, wide expanses, solitude and our dog.